We really love the superbly styled and luxurious tented suites, their stunningly contemporary designs an intriguing mix of canvas and stone! We love the luxurious tented suites constructed from canvas, timber and with stone-packed walls – they really are some of the most attractive rooms of any of the South African game lodges! The natural topography of this area is breathtaking – here you can enjoy a dramatic landscape encompassing vast plains, dense bushveld, winding rivers, deep gorges and majestic mountains! This is a private concession area with no other lodges – this exclusivity means you’ve got some 23000 hectares of concession area to explore yourself with not another vehicle in sight! It’s quick and easy to get to Marataba – just 3 hours drive north of Johannesburg and so perfect for a quick weekend getaway! Game viewing perhaps isn’t on a par with the more famous lowveld reserves for example – but then again they don’t boast the incredible mountain landscapes and scenic beauty that you’ll enjoy at Marataba! Not the cheapest option out there – but check out all of the rave reviews on Tripadvisor and we’re pretty sure you’ll come to the conclusion that the stretch is worth it! seemingly inspired by ancient African ruins, this lodge boasts 15 exotic tented suites which are an intriguing mix of canvas, wood and packed stone walls - each exquisitely furnished and decorated with a modern twist! Marataba and the Marakele National Park are an inspiring example of how a private/public partnership can rejuvenate a previously stagnating reserve. And what a reserve this is! 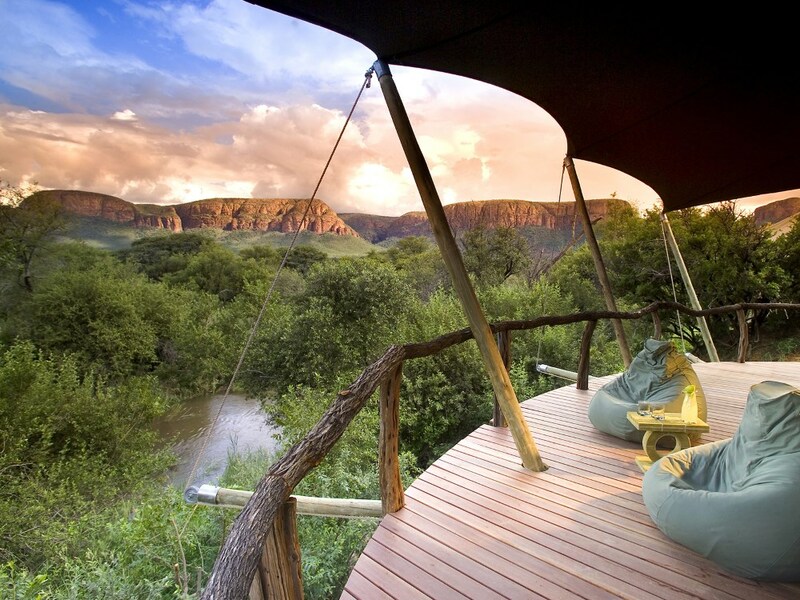 Located in the foothills of the Waterberg Mountains, this malaria-free park boasts dramatic landscapes encompassing vast plains, dense bushveld, winding rivers, deep gorges and majestic mountains – it is arguably the most stunningly scenic reserve in the country! But along with its undeniable beauty and dramatic landscapes, it’s also a haven for an impressive variety of wildlife due to its location in the transitional zone between the dry western and moister eastern regions of South Africa and thus sports a hugely diverse array of fauna and flora. Marataba is a lodge truly in keeping with its spectacular surroundings. Seemingly inspired by ancient African ruins such as those found at Mapungubwe and Great Zimbabwe, the lodge boasts 15 exotic tented suites which are an intriguing mix of canvas, wood and packed stone walls - each exquisitely furnished and decorated with a modern twist they really constitute supreme luxury of the highest order! 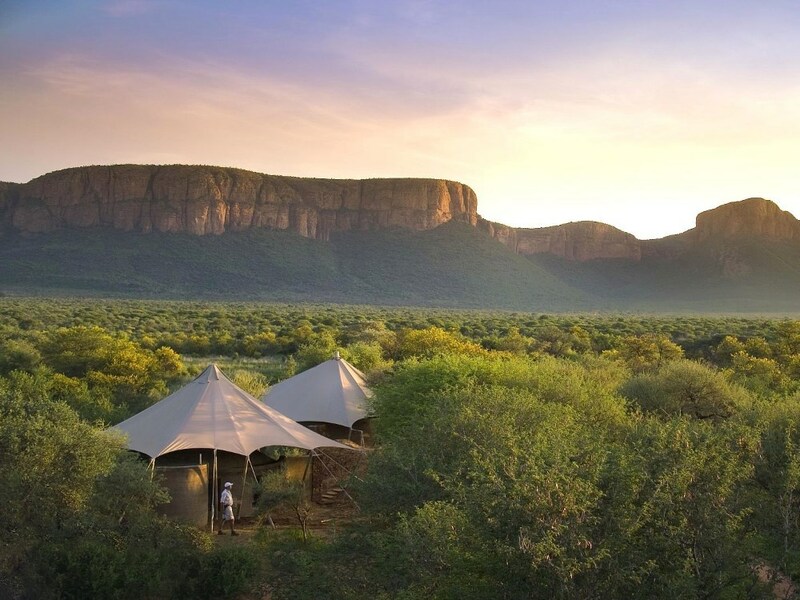 These tents each have their own private deck overlooking the sweeping plains and meandering river below whilst the Waterberg mountains tower majestically above. A lavish free-standing stone bath invites you to soak up the opulence of the room and there are both indoor and outdoor showers – where you can fully take in the dramatic scenery around the lodge. At the end of another adventurous day, the hugely comfortable king size bed lures you to slip under the covers and fall asleep to the timeless night sounds of the bushveld. The lodge enjoys a private concession area covering some 23 000 hectares in the heart of the Marakele National Park –you have the opportunity to view all the large game species from elephant and rhino to the big cats, as well as an amazing variety of birds including the largest colony of endangered Cape vultures in the world (more than 800 breeding pairs have settled here) As far as flora is concerned, the park is home to rare finds of yellowwood and cedar trees, 5m high cycads and tree ferns amongst others. You will enjoy exploring this vast wilderness with an experienced ranger who has an intricate knowledge of the bush, a passion for conservation and its wildlife – the rangers are seemingly a walking talking bush encyclopaedia able to take on a barrage of questions from the kids whilst dispensing entertaining chunks of safari trivia and a host of mind-boggling stats and fascinating facts to the older passengers! Guests can also go on bush walks where they capture the spirit of following in the footsteps of the brave explorers of bygone years - along with a qualified guide, you’ll head out on designated routes through the park, each route having been created by animals walking these same paths, year after year, creating a well-worn route through the dramatic landscape of the Waterberg Mountains. Your guide will share their expertise on the medicinal uses of the local flora whilst you’ll get the opportunity to view animals at eye level and experience the rhythm and energy of the bush in a much more connected way. In the warm months of summer, grab your swimsuit, hat and sunscreen and venture out with your guide to swim in the naturally formed rock pools at the base of the mountains - a sumptuous picnic and fully stocked bar will accompany you so you can either frolic and splash in the water or relax with drink in hand and take in the splendour of your surroundings! The lodge also aims to create a fun environment for children - they will get the chance to experience what it's like to walk in the shoes of a game ranger, even just for a day! The rangers will take special care to spend time with the youngsters on the game drive or back at the lodge, teaching and guiding them through the wonders of nature and the African bush! Back at the lodge on your down time you can soak up the sun around the lodge’s swimming pool, read a good book, enjoy a cold beer or glass of wine or share your adventures with family and friends - all in the comfort of the architecturally stunning main lodge area which includes a cozy lounge with a fireplace, as well as a refreshing swimming pool with pool loungers and hammocks placed in the trees! Dining at Marataba is an inspiring and memorable experience – it may be lunch under the lantern tree watching the animals drink at the waterhole, dinner on the deck under the stars, a sundowner stop with yummy snacks on the plains, or a bush breakfast and bush picnics next to the river! 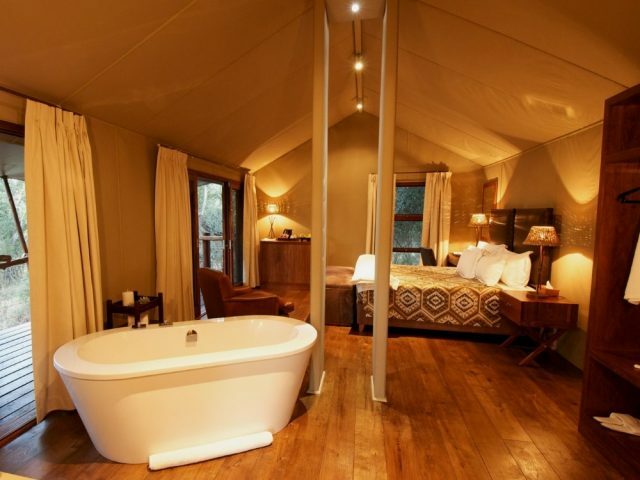 This tented camp is truly one to remember and promises a once in a lifetime safari experience! Children aged 6 – 15 years pay 50% of adult sharing rate when sharing with parents. 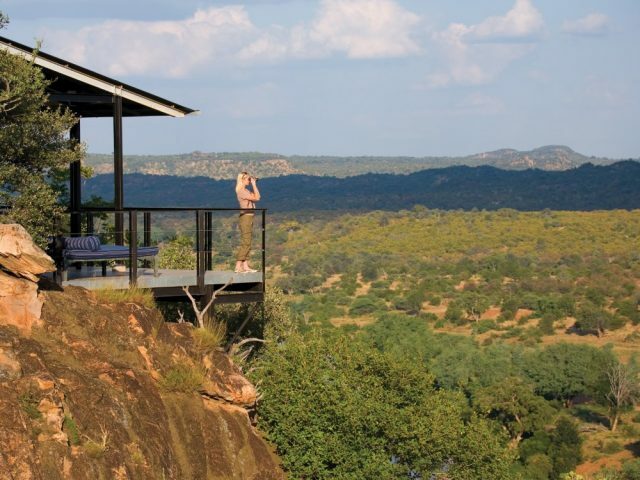 Soak up 180 degree views from the spectacular cliff top location overlooking the Luvuvhu River – stunning rooms are unashamedly contemporary and stylish! Gorgeous tented suites offering old world safari style and romance with contemporary luxury to guests who will also enjoy excellent game viewing! 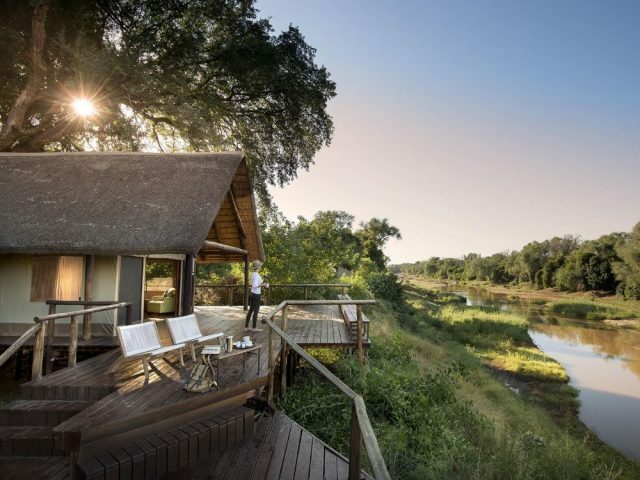 Lovely tented camp in a superb location on the banks of the Luvuvhu in the scenic far north of Kruger with its fever tree forests, baobabs, huge herds of buffalo and elephant!